Fifteen of the Bach Flower Remedies are made from trees and there’s a wonderful contrast between the size of the trees and their often tiny flowers. Most of the Bach Flower Remedy trees are growing at Offshoots and in the surrounding woodland. 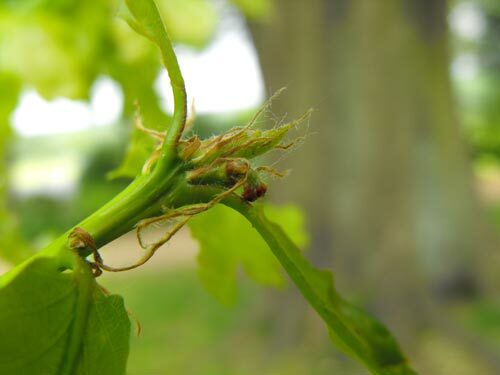 Can you spot the tiny red female oak flower in this picture? Saplings of Bach Flower Remedy trees are being lovingly tended on-site, gifted by Trees by Post, Buckingham Nurseries and Mail Order Trees. Thank you to all the nurseries who donated trees to the project. Many of the trees are only in flower for a couple of weeks and the flowers are so small that they’re easy to miss. 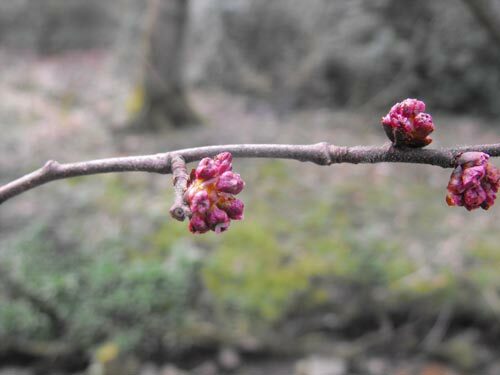 Elm (Ulmus procera) is in flower in March and April in the UK (depending on your location). Watch out for the pink haze on the trees before the flowers are replaced with the pale papery seedheads. We made elm flower remedy at the start of April following Dr Edward Bach’s instructions for making a remedy by the boiling method. Tiny elm flowers and twigs are boiled up for 30 mins, cooled, filtered and then preserved in brandy to make the Mother Tincture. From this Mother Tincture, 7 drops are taken and further diluted in brandy to make the stock bottles that you will see in health food shops in chemists. Elm flower remedy is for when you feel overwhelmed; you’ve taken on too much and don’t think you can cope. As elm is taken it helps you to see things in perspective again. 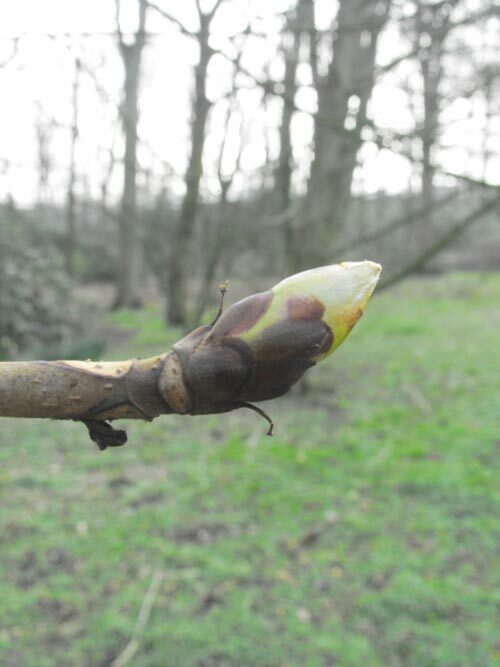 Chestnut bud is in flower at the same time as elm; chestnut bud flower remedy is made from the sticky buds of the Horse Chestnut tree (Aesculus hippocastanum). Chestnut Bud is the Bach Flower Remedy that aids learning, so it can be used as an aid for studying. It’s also used to help you learn lessons in life so if you find yourself in similar situations (relationships, issues with people etc.) over and over again chestnut bud will help you learn what you need and move on. Some of the 37 plants we’re growing for the Bach Flower Remedy garden were already on-site at Offshoots because they’re useful in Permaculture. Wild Rose, Walnut, Sweet Chestnut, Elm and Honeysuckle are flourishing with Holly, Oak, Hornbeam, White Chestnut and Chestnut Bud just a short walk from the garden. We’re growing other plants from seed and have also been approaching nurseries asking for donations of plants for the project. We’ve been staggered by the generosity of the nurseries who are donating plants to the project. This picture shows the first arrivals on-site. 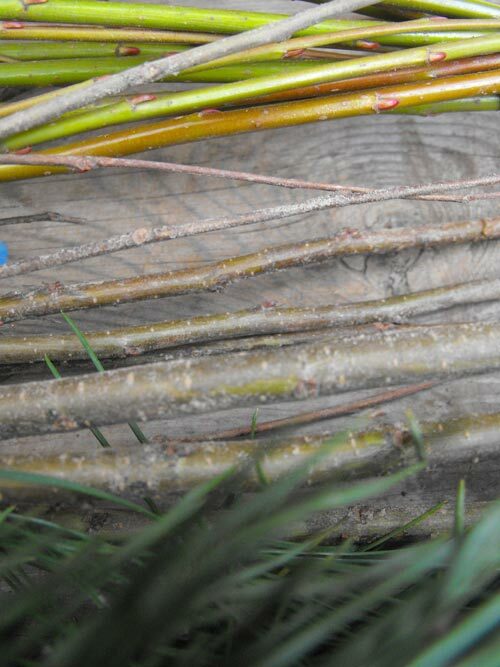 Beautiful Willow, Elm and Scots Pine which arrived from Buckingham Nurseries along with some Gorse plants.